They are calling it the deal of the century. Travis Johnson, a Texas man struck gold two weeks ago, while going to a garage sale near his home in the suburbs of Houston. Searching for items to sell and keep for himself, he stumbled upon something far more significant. 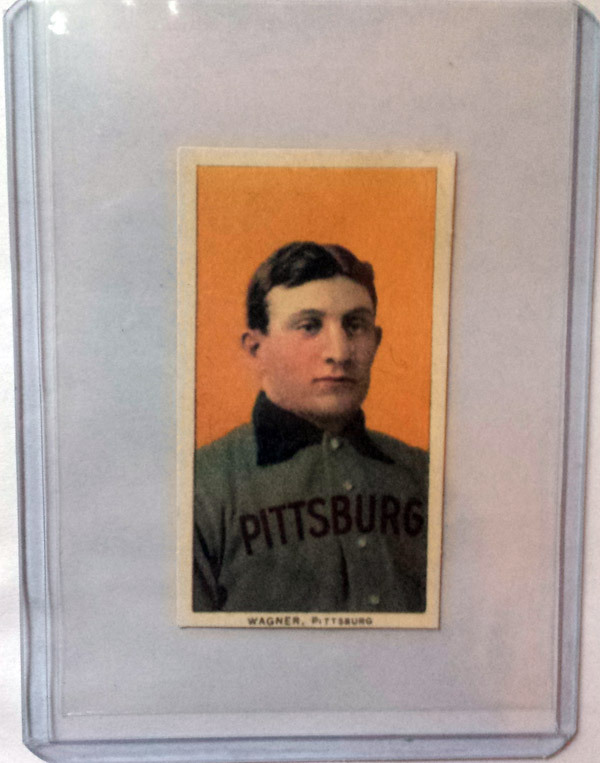 A T-206 Honus Wagner. SNO: I’m sure you are still in shock. Tell us how you came about this find. TJ: After going from garage sale to garage sale for about 3 hours, my wife and I decided it was time to head back home. On our way back, she urged me to go to just one more on the way home. I obliged and pulled over to get out. I vividly remember the entire thing. From my wife giving me grief for pulling up and parking directly in front of the drive way, to me joking with the home owners about scoring a free donut from the box they had out. We picked up a Little Tikes toy box and a few board games. As we were about to go back to our vehicle, I noticed a table with some various toys and trinkets on it. Lo and behold, the Wagner was just sitting there. SNO: How did you feel when you saw it? How did negotiations work out for you? TJ: When I first saw it, I assumed it was real because of how authentic it looked. It didn’t say “reprint” anywhere, or anything like that, so naturally you have to believe it is real. I asked the owner and he confirmed that it was real. 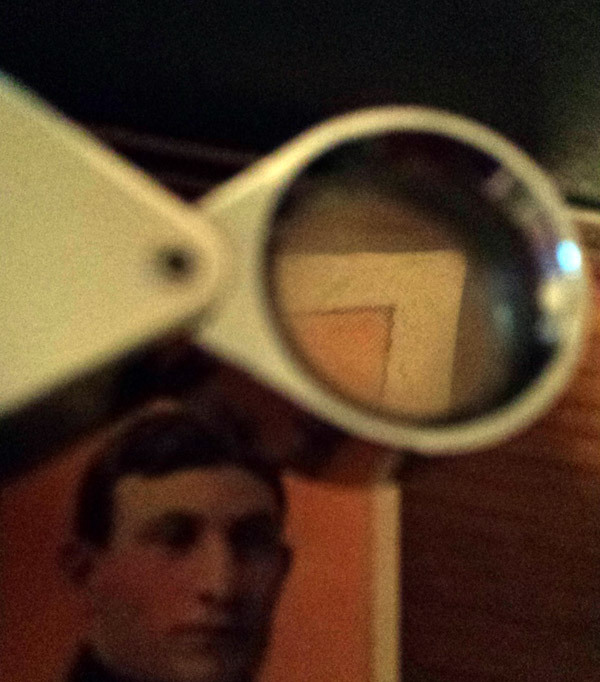 I almost walked away but then I remembered I brought my jeweler’s loupe for a closer inspection. Between you and me, I didn’t really know what I was looking for. I figured if I pulled it out and stared at it intently before letting out a concerned “hmmm”, that he would be more open to negotiations. SNO: So, how did you close out the deal? TJ: I will probably catch some flack for this, but I saw that he was selling some poker chips at his garage sale. This is a classic tell-tale sign of a recovering gambler. These types just can’t say no to gambling. With his wife inside the house presumably to get another cup of coffee, I offered him a classic game of rock/paper/scissors. Winner take all. If he wins, I pay his hefty asking price of $300. If I win, I get the card for free. That question made him insta-sweat. He started fidgeting around like crazy, and looked back to make sure his wife wasn’t around. He agreed, but little did he know, I am known around here for my R/P/S abilities. TJ: So anyway, I ended up losing. Thankfully, to the recovering gambler, you have about a 100% chance to reel them in by asking to go double or nothing in a 2 out of 3 battle. I told him I would pay him $600 if he won, but if I won, I would get the card … AND the donut of my choosing … for free. In the end, his paper was no match for my scissors…twice in a row. I walked away with a beautiful card, and a delicious late-morning treat. SNO: Amazing! What were your thoughts about your new prize right after you won? TJ: I was absolutely elated, Jen. It was quite possibly the most delicious donut I had ever eaten. It had sprinkles on it, and whenever I’m at the donut shop, I always want to get one with sprinkles, but thought that it just wouldn’t look right if a grown man ordered a donut with sprinkles on it. (Chuckles) It was so good though, I just may reconsider next time. SNO: I was talking about the card. TJ: (Laughs) Oh! Of course you were. I was very, very happy. My concern was that it didn’t have any sort of authentication papers with it, and i wasn’t about to go asking the loser…err…previous owner of the card for them. Surely he would still be sore over losing such a valuable card. SNO: Did it ever cross your mind that it may be a reprint? TJ: No, not at all. 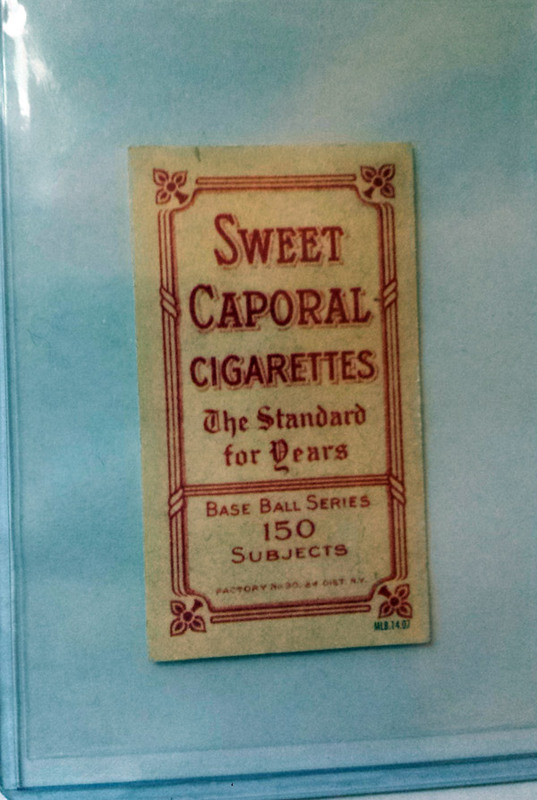 Like I said, reprint wasn’t anywhere on the card, and the back showed “sweet caporal”. It didn’t really matter to me though. The value isn’t whether it is real or not; the value is if it has a certificate of authenticity. TJ: Don’t believe me? Go on eBay and check all the Honus Wagners for sale. You will see loads of them. Every now and then a real one will pop up, but since it is not graded, the owner has to list it as a “reprint” in the listing since those tyrants at eBay force them to. They are losing out on a lot of money because of this. SNO: Wouldn’t it be worth significantly less if it were a reprint – graded or not? TJ: That’s not how it works, Jen. You have to understand how the seedy underbelly of the card collecting world operates. If you have a card that is authentic, but can’t grade it for whatever reason, it simply won’t go for much money at all. The proof is in the eBay pudding. Check the sales. Everyone who posts up a real one without authentication doesn’t go for much at all. An authenticated version of this card sold for over $2 million dollars recently. I don’t recall if it was real or not, but the difference is that it was authenticated. SNO: How did friends, family and others take your news? Were there any doubters? TJ: Some were happy for me, but some doubted. Especially guys from online web forums. They were plain nasty to me. A lot of haters and trolls. I think the kids these days use the term “haters gonna hate”. I have lived that for the past week. 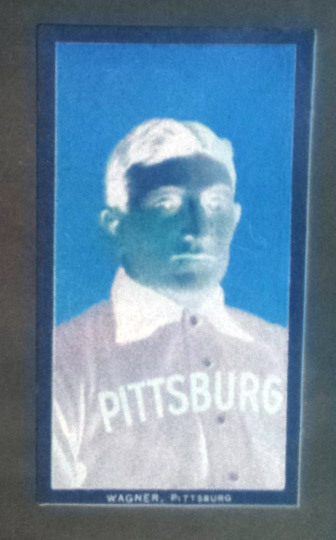 I found out online that you can test if a card is certifiable by inverting a picture of the card’s colors. If the border comes out blue, then you are golden. If it comes out golden, you are blue. See what I did there? Anyway, here is a picture of it that i carry around with me at all times. 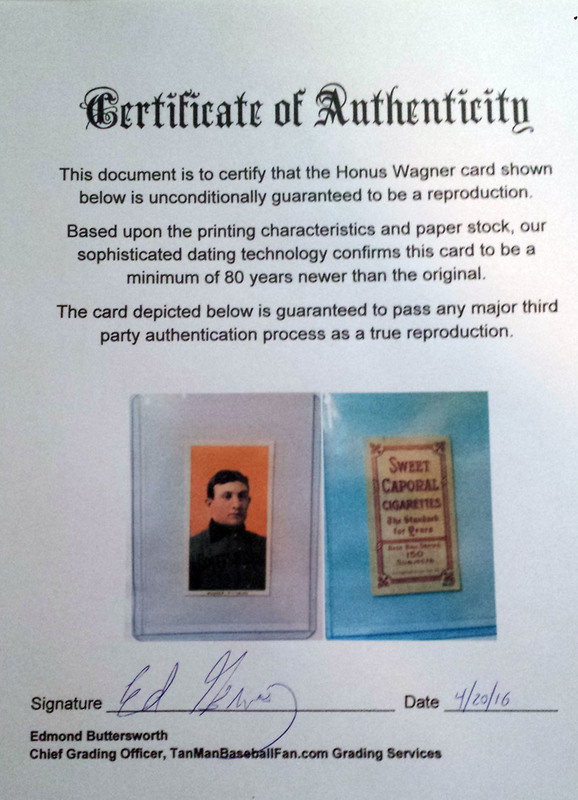 SNO: Is this all the proof you need for a windfall profit, or do you really need a certificate of authenticity? SNO: I’ve never seen anything like this before. Are you disappointed in the results? TJ: Disappointed? Jen, you are missing the point entirely. 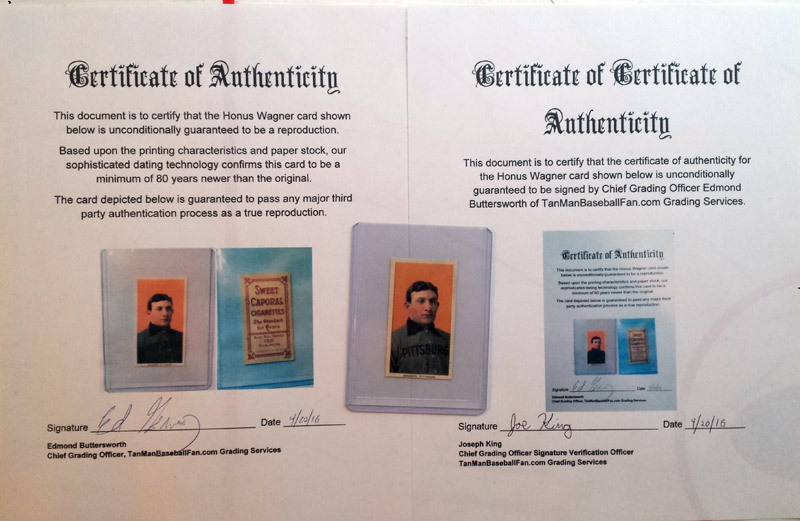 My card is the only known reproduction Wagner in existence stating that it is a reproduction! SNO: The name Edmond Buttersworth rings a bell. Wasn’t he somehow involved in that big mess back in the 1980’s between the Mouschi’s Grocery Store chain and Burger King? TJ: I don’t know anything about that. I’m more of a Whataburger guy myself. SNO: What do you anticipate this “rare” card to be worth? TJ: Why are you putting quotes around the word rare? SNO: No reason. How much do you think you will get for this card? TJ: The sky is the limit at this point. I may just be able to retire on its proceeds. I did go one step further, though. 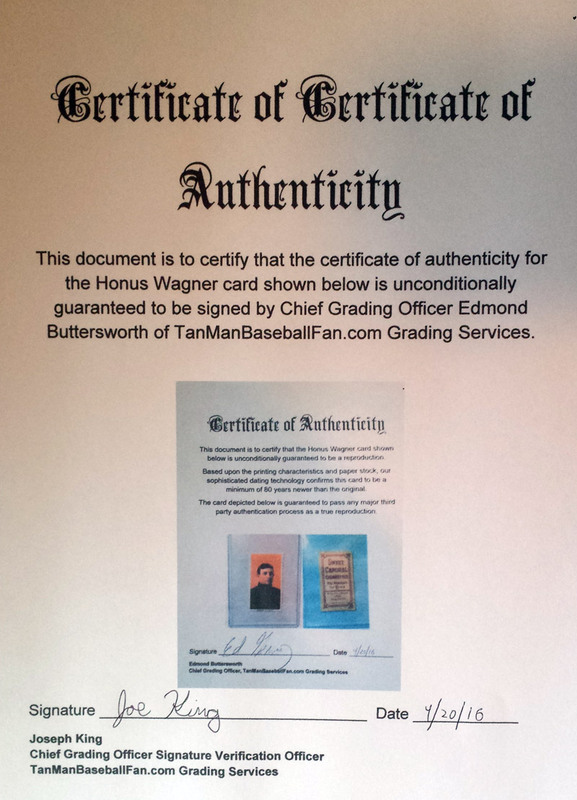 From time to time, you have a problem in the card collecting community with forged certificates of authenticity. To remove all doubt, I ended up getting the COA certified from Joseph King, the Chief “Grading Officer Signature Verification” Officer. (CGOSVO). SNO: That name sounds familiar as well. Wasn’t he the reporter that made the public aware of the 1990 Donruss Frank Thomas scandal a few years ago? TJ: I couldn’t tell you, Jen. I’ve never heard of that before. SNO: A certificate of certificate of authenticity? TJ: That’s right, Jen. Or, a COCOA as it is known in the card collecting community. Armed with the card itself, the COA and the COCOA, this card will no doubt break records. SNO: How can someone place a bid on this card if they want, or just watch it to see how well it does? SNO: Good luck on your sale and may your wife & son have a great time on their mission trips this summer! TJ: Thanks, Jen. I appreciate that. Now if you’ll excuse me, I’m off to buy myself a victory donut with sprinkles. AND NOW …. The rest of the story …. you’re a jerk…if you knew how much the card was worth (because you knew it was real) 300 bucks is a bargain…You should have paid that and walked away…you took advantage…shame on you. Thanks! I had fun writing it. It is real … real fake! And I did print them at home 🙂 Read the end of the article and see what I mean. It was just a fun gag I decided to write up for your reading enjoyment 🙂 You aren’t the only one though – a lot of people thought I was being serious on this. My Journey in … Comic Book Collecting? $1,000 + PSA 10 common card prices! Will they hold their value?